Discovery Bay Football Club power to their maiden title. Discovery Bay put in a powerhouse performance to seal the division one title with emphatic 8-0 win against RBFC. Once again golden boot youngster Matt Zoeller was on hand with a double while seasoned players Oli Rendall and Stuart Myall were on the scoresheet once more. A delighted but yet confident manager Gary Rollinson described his side like an unstoppable freight train...you just could not stop the DBFC juggernaut he yelled after the game. Accolades came think and fast from around Hong Kong. Previous champions Club Tropicana were first to congratulate them and were at Tsing Yi to hand over the trophy. Congratulations DB, best team this year, no question added Bilbey. Current runners up USRC manager Lawrence Rudge added well done DB, the combination of youth on the pitch and old age on the sidelines was potent. Well-deserved winners he stated. First Semi Final of the Champion League took place on Friday night with USRC Power too strong winning 5-1 against Jleaguers. Jleaguers GK making a couple of mistakes to give USRC Power 4-0 lead at half time. USRC Power goal scorers Humberto Toscan double along with Massimo Michielini and Steve Cairns goals to set up a final show down against either FWD or BANTS. In other division one games the relegation battle is heating up with none of the bottom three able to secure any points. Ruby Murrays lost in a close encounter 2-1 to Club Tropicana. Club Tropicana took a 2-0 lead at the break, with fairly average football described Bilbey, Ruby's had numerous chances but fail to convert, we had two chances and two well taken goals from Captain Jack Culiane and a superb lob from Paul Short he added. Second half Tropiciana stepped up a gear and we were much better and dominated for first twenty minutes or so. Ruby's kept battling and got back in it with a great header from CK Fung to set up thrilling and tight finish but Club Tropicana held on. Bibley added if Ruby's put out a squad and play like that every week they will stay up. Bants were not able to distance themselves from bottom pack with FWD winning 6-2 against them. FWD Mathieu Demange hattrick along with newbie Karif Arun scoring a double while Adam McCarthy scored a double for his side. Bants were bare 11 and played with 10 for all of second half as an already depleted squad found it hard to recruit new players during the week. In the other important relegation match Spartans secured 2 -1 win against bottom side USRC experience. A fine Damo Pilat header and Ben Walters goals was difference on the Friday night match. Experience manager Rick Leone said after the match, the game could have gone either way but the end sums up our season. In remaining game Team Shotgun score a narrow 1 nil win over Goodfellas. The lone scorer Derek Huang in a tight and well contested game at Tai Po’s Kwong Fuk Park. In Division 2, leaders Young Guns came back to action with an easy 6-1 victory over KCC in a Monday night soccer at King’s Park. D.Tse and Anka Wu both scored a double while S. Fan and D. Chan also added to the tally. Anthony Garreau got one back for KCC. 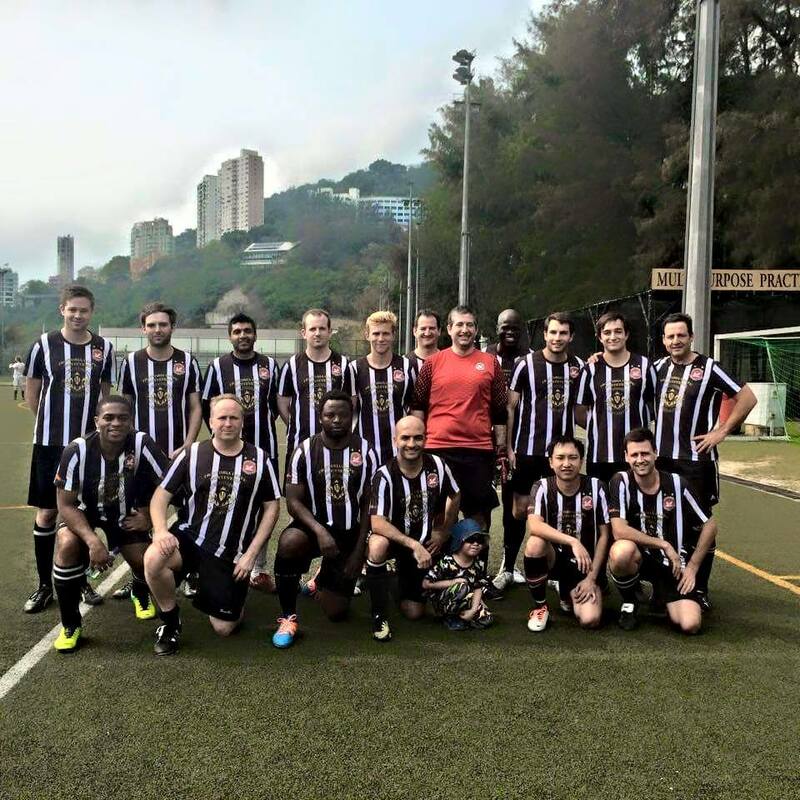 In the weekend, HKK are still keeping their title hope alive after trouncing Legal Head 6-0. H Chung, J Lieske, J Seegatz, S Cohrs and N Himmalai were the scorers for HKK. San Pellegrinos stayed firmed at 3rd by delivering a 3-0 victory over Corinthians. Hendry, Darcy and Sonnermann all put their name on the scoresheet. Corinthians Team photo before suffering a 3-0 loss to San Pellegrinos. In mid of the table we saw Shooter maintain their good form and climb to the 4th spot after beating BOCs 3-1. Toshiya Sugiyama, Yasuhiro Yoshimura and Yoshiki Kobayashi were their scorers and according to manager of BOCs, their second goal was a top class volley. BOCs got one goal back from their striker Jason Lee, and also a red card for Nadeem Ejaj. Elsewhere SiHK edged over Revolution 2-1 in a tight game relying on goals from Ryan Breen and Gerald Nixon. Revolution’s scorer was Andy Burwell. Last but not least, leaders Young Guns continued their winning streak by beating TWF 2-1 in the final game of the weekend. David Tse and Gordon Chung both scored for YG while Jamie was the scorer for TWF. According to TWF coach, it was an unlucky game for TWF as they missed 3 clear chances in the first half. In the Legends League 28o & 90% humidity at 1pm didn't stop the French Dragons and FWD playing a decent game at Ma On Shan. FD seemed to have a slight advantage from the beginning as they had 17 players versus 12 for FWD. Scoring fast was the key in this fixture and both Paul and Gary did that very well for the Dragons scoring 2 goals each in the first 30 minutes. The 4-0 score and the second half allowed all subs to replace tired legs with Jorge scoring his 16th & 17th goals of the season.